As parents; it is important for our children to play and interact with their toys and playthings. No matter what the age of the child, they all have lots of fun with their toys. The point of this article is to stress the importance of safe play for children under the age of 14. Some toys are thought as educational or teaching toys and while that is always a good thing it might not be safe. 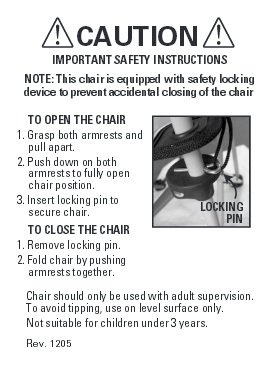 It's important to keep in mind that safety should always come first. Each and every year thousands of kids are injured by toys. Injuries on playgrounds and trips to the emergency room are worrisome for parents and with caution and rules in place many accidents can be avoided. Recalls are mandated by the consumer protection agency and most are voluntarily recalled by the manufacturer. Just because a toy sits on a shelf in the store, or you are buying used toys at a garage sale or passing a toy down from a friend or family member doesn’t mean that toy is safe. Toys accumulate quickly and before you know your home is full of them. Given as presents, or passed down to the next generation quite often there isn’t much thought given to a child’s safe play. This article is a parents guide to toy safety and safe play..
Did you know that The U.S. Consumer Product Safety Commission (CPSC) closely scrutinizes and regulates toys that are imported or made in the USA. Any toys made in — or imported into — the United States after 1995 must comply with CPSC standards. Also, the US CPSC, moto “Is saving lives and keeping families safe”. Not only are these guidelines for toys, but the ASTM has set forth strict guidelines for playgrounds and bounce houses for residential and commercial use and the top points will be addressed in the article. Below are some tips to help parents understand some of the safety issues and warnings with toys to ensure they are safe to play with. Read on to learn and discover what to look for when purchasing toys and how a few easy ideas for safe use can often prevent childhood injuries. Listed below are easy to remember tips to help you choose safe and age appropriate toys for your children. 1. Read the label on the packaging. Warning labels are required and offer important information about the use of a toy and what ages the toy is safe for. Not recommended for ages 3 and under warning poses a choking hazard. 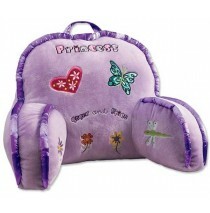 Look for Flame retardant" or "Flame resistant" on fabric toys. Stuffed animals ought to be washable. Lead-free paint should be labeled as such. Art materials must state non-toxic. Below is just one example of a label. 2. Choking hazard; when you do a visual inspection of the toy. Think about the parts and if your child’s puts it into their mouth could they choke? Parts should be larger than their mouth to prevent choking. Ask yourself, could any of these parts fall off and pose a threat? Toys with smaller balls have strict regulations since round objects can absolutely block or wedge in the child’s airways. The guidelines are this; every ball less than 1.75 inches is forbidden for sale to children less than 3 years of age. Marbles, magnets, balloons and any games that have small parts are dangerous for children. 3. When buying used toys caution is the important word. Ask yourself these questions, is the item damaged? Do you see loose parts? Choking hazard for small parts visible? Also keep in mind that you will need to research whether the item has had safety recalls or made prior to when strict guidelines were introduced around 1995. An online search can easily reveal recalls, issues and problems. 4. Toy box hinges and lids. Do you know the hidden dangers? A child could become trapped inside, or the lid could fall on your child’s head. If possible, store toys on open shelves which are attached to the wall. 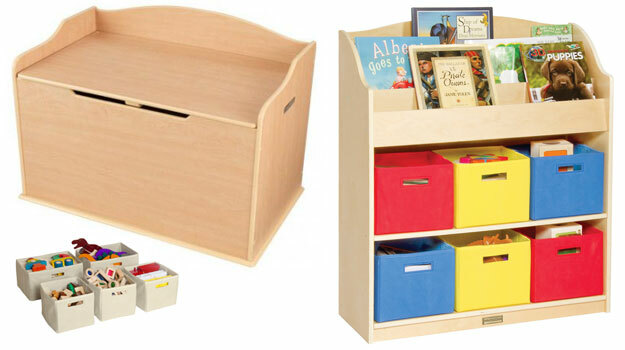 Storage bins without lids are great options and if you must have a toy box remember the guidelines below when shopping. Inspect the packaging and look for hinged lids. This help keep it safe and when opened the lid should stay up at an angle. You can easily attach a hardware piece if you don’t have one. Corners should be rounded and smooth to the touch and never use a locking lid. If you toy box has a lid make sure there in ventilation holes on each side. Typically, the cut-outs are on both ends with a longer one on the front side. 5. Should you throw out broken toys is a valid question? Not necessarily, it really depends on what the toy is and what is broken. Many brands will sent you a replacement part or repair kit free of charge. If that takes care of the problem then keep it. It you have a broken toy with sharp edges or you find yourself trying to fix it with a bandage (so to speak) then most likely it should be thrown out. If you feel the toy is dangerous do not let your child play with it. Replace broken toys and ensure the safety of a child. Let’s take a look at the public playgrounds and swing sets for residential backyards. The advised age span for will vary by manufacturer and type. 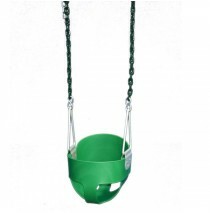 Using a kind of swing set which is made for the age range of your children is a vital part of keeping them safe. The placement of the structure is also important for safety. It needs to be placed in an area where it is way from drives and roads. The area should also have correct drainage and sufficient shade. It should also be away from obstructions including tree stumps, buildings, large rocks, and tree branches or wires. 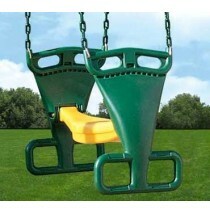 Swings and slides should be placed in the shade or facing north so they do not heat up under direct daylight. It is important that you meticulously examine the structure on a regular basis. Inspect for any coarse surfaces or pointy edges in addition to items that are sticking out such as screw and S hooks. Wooden swing sets will have to be treated every few years in order that they will be able to bear rot and insects. Inspect all of the small parts on your wooden swing set to make certain they’re in decent form and do not have to be replaced. 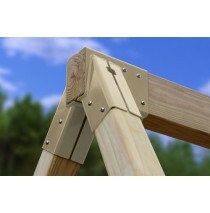 Visually inspect the hardware in a backyard swing set. You are making sure it is recessed and that is does not have a plastic cap. ASTM considers this to be a choking hazard. Watch for jagged, exposed or pointed edges that are sharp as this can injure your children. When visiting the local park or school playgrounds do a visual inspection around the whole structure and look for potential dangers. The surface under the playground is often overlooked however it is another important part of making it safe. The surface underneath will act as a shock absorber in the event of falls. It ought to be between 9 and twelve inches deep and at least 6 feet round the whole playground. Good materials to use for your surface are rubber mulch, rubber tiles and pea gravel. 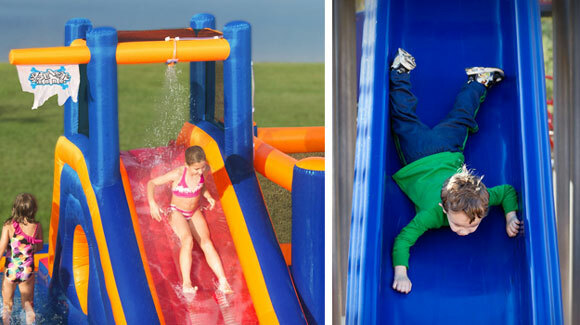 Slide safety isn’t just for playgrounds; it’s for home use and that includes bounce house slides. Just like the saying, “knowledge is power” teach kids to play safe on slides. They need to learn how to identify possible hazards too avoid dangerous situations. Knowing that most children visit the local park the first thing they head for is the slides. They love to climb and then slide so safety is a top concern for everyone. Parents and caregivers ought to follow the guidelines at all times so that children understand and follow the rules. Teach the children to always go down the slide feet first and never head first. These safety guidelines apply to residential and commercial playgrounds and inflatable bounce houses. Explain to them in terms they can understand; why they should not go down a slide head first. Educate the kids to never run down the slide and to never climb from the bottom of the slide up to the top of the slide. Also, running up the slide is a big mistake. Constantly teach them to look before coming down the slide to ensure that the slide is clear. When children reach the bottom of the slide they should move away promptly. Be careful of metal slides as they often are very hot from the sun beating down on them. Prevent a burn from happening. Children should always have shoes on at the playground and shoes off when using a bounce house. Supervision by adults is always a necessity when children are playing. Bounce house safety is easy when you remember the following rules for weather conditions, weight limits, age and supervision as outlined below. Prevention is the key to playing safe so no one get hurts. Most kids think they should be allowed to set up the bounce house because it’s super easy to do so. Don’t allow them to set I up. Bounce houses are inflated by blowers that are plugged into electrical outlets so caution is needed and only adults should inflate or deflate. Supervision by an adult is necessary at all times. A parent, adult or caregiver needs to be present and positioned at the point of entry so you can see everything happening inside. You will need to stop the stunts and restrict the number of jumpers at a time. The inflatable will have a number rating of users who can safely play at one time. If the manufacturer recommends only 2 to 3 kids at one time inside jumping then you will have be the enforcer. Understanding, the number of users that can play inside together will have to be communicated to the children so they understand they might have to take turns and be patient. 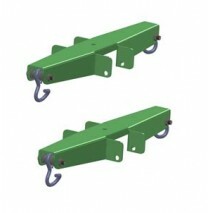 These guidelines are set forth by the manufacturer and have to be followed. Before any one starts jumping inside you will need to find out what the weight limits are for the bounce floor and for the slide. Never allow kids to secure inflation tubes, pound anchors into the ground or to control the electrical blowers. Children must stay back from the play area while the jump house is inflating. Remember, the no pet rule; they aren’t allowed because their paws will puncture the fabric and result in holes causing the unit to deflate. Weather forecast is very important because the outdoor conditions should be monitored carefully. If a storm sneaks up; if there is lightning; high winds; the conditions are too dangerous for play. The climate time and time again gives the impressions of being a nice day and can quickly turn against us. Keep an eye on the conditions and storm warning because this is one situation you will want to avoid. Never use an inflatable in windy or rainstorm conditions. As far as toys in the crib, it’s really easy to just say “NO”. It has been debated far to long and there are many opinions on the subject. Anyone can sign up to receive product recalls and they are delivered right to your inbox. Simply visit www.recalls.gov and you can use there search features to check for a specific toy.